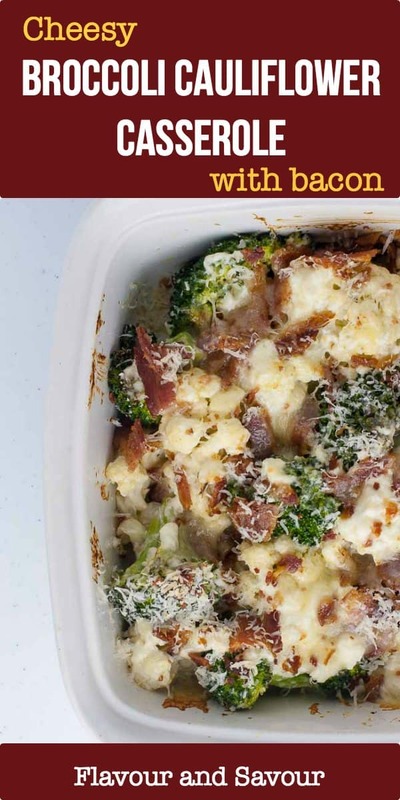 This low-carb Cheesy Broccoli Cauliflower Casserole with Bacon is guaranteed to be devoured! 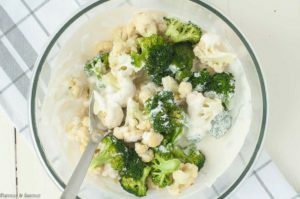 It’s creamy, cheesy and full of flavour. 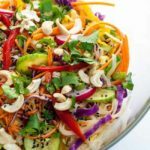 With only 2 carbs per serving, this dish is keto-friendly. Comfort food at its best! This veggie casserole may not photograph well, but you won’t have any leftovers when you serve it. 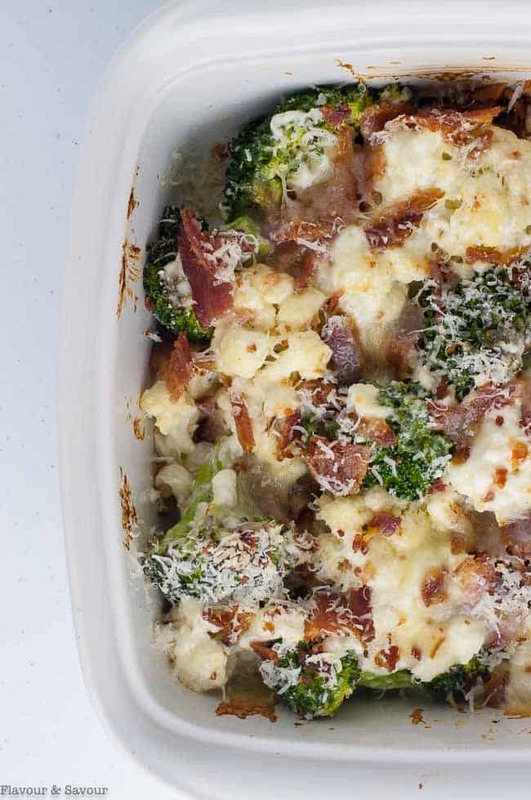 It’s warm and creamy and loaded with bacon, cheese and healthy broccoli and cauliflower. Try it as a side for an everyday weeknight meal or even for a holiday dinner. You won’t find many other recipes for casseroles on this site. In fact, this is the first! The word “casserole” brings to mind images of Pyrex dishes concocted with a can of soup lovingly offered at church dinners when I was a child. 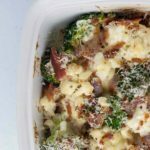 High-fat casseroles are not the way we usually eat, and not representative of my style of cooking here on Flavour and Savour. BUT . 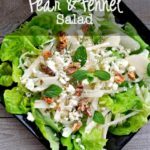 . . Denis loves this dish and for health reasons, he is on a low-carb, higher fat diet. 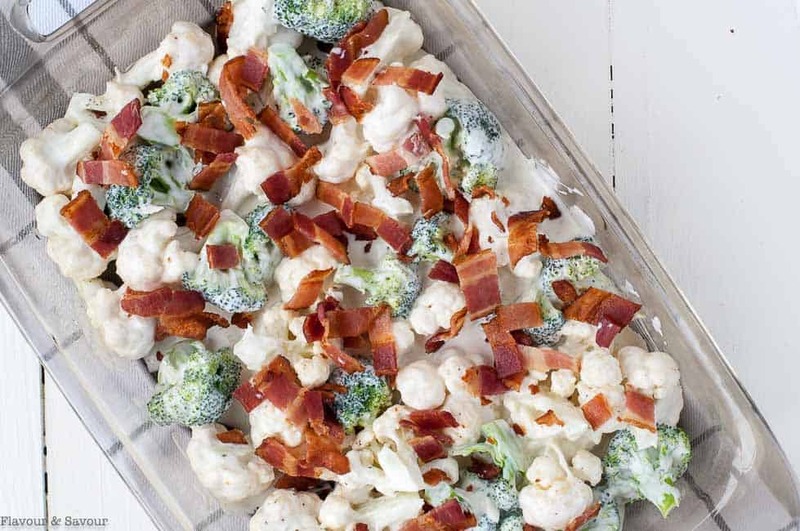 I made this with organic broccoli and cauliflower, hormone-free/ nitrate-free bacon, home-grown garlic and organic dairy products to keep it as “clean” as I could! 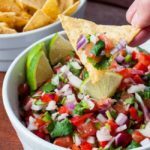 I decided to share it here today with you, as it’s so tasty and makes a great side dish. 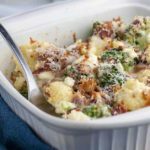 This Broccoli Cauliflower Casserole with Bacon is easy to make. Best of all, you can prepare it ahead of time, refrigerate it and pop it in the oven to bake just before dinner time. After you’ve cooked the bacon, start by preparing the veggies. 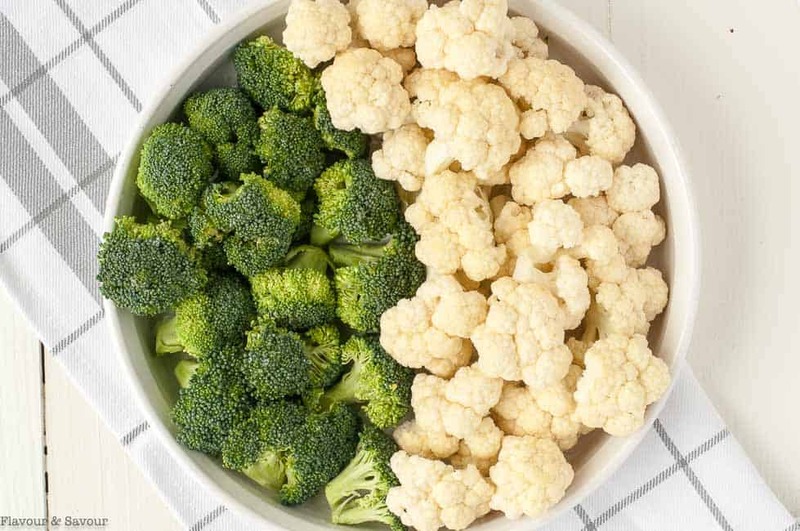 Cut broccoli and cauliflower into small florets, toss with a little olive oil and roast in the oven until fork tender. Remove, let cool, then pat dry with paper towel to remove any remaining moisture. This step is very important, so don’t skip it. Soggy vegetables will result in a watery casserole that will not appeal to anyone! Once you’ve patted them dry, combine the roasted veggies with a mixture of cream cheese, Parmesan cheese and minced garlic. 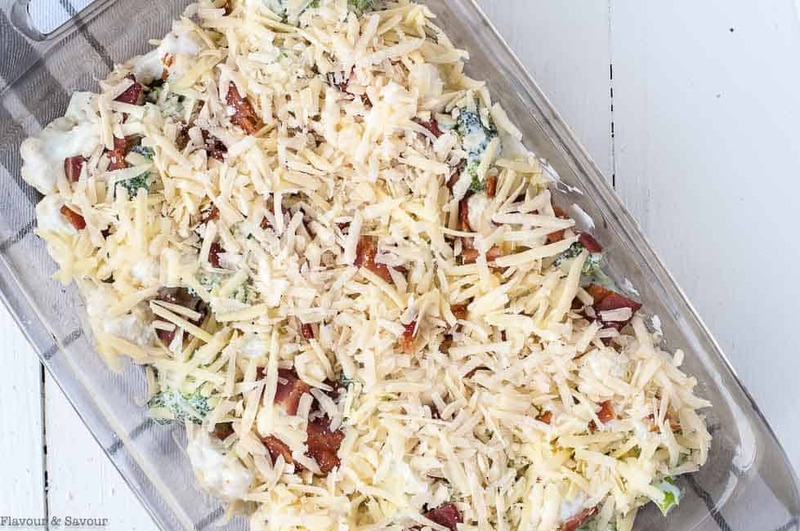 Spread in a baking dish and add chopped cooked bacon on top. Smother with a the remaining Parmesan cheese and either refrigerate until dinner time or bake in the oven right away. Then scoop and enjoy all that cheesy-bacon deliciousness. Be prepared to be asked for seconds! *A note about bacon. Hormone-free, nitrate-free bacon is available in many supermarkets now. 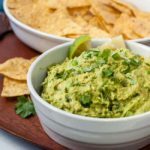 Looking for more delicious keto side dishes? 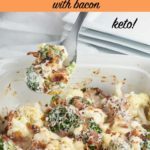 Try this low-carb Instant Pot Mashed Cauliflower with Bacon and Cheese! This low-carb Cheesy Broccoli Cauliflower Casserole with Bacon is guaranteed to be devoured! It's creamy, cheesy and full of flavour. 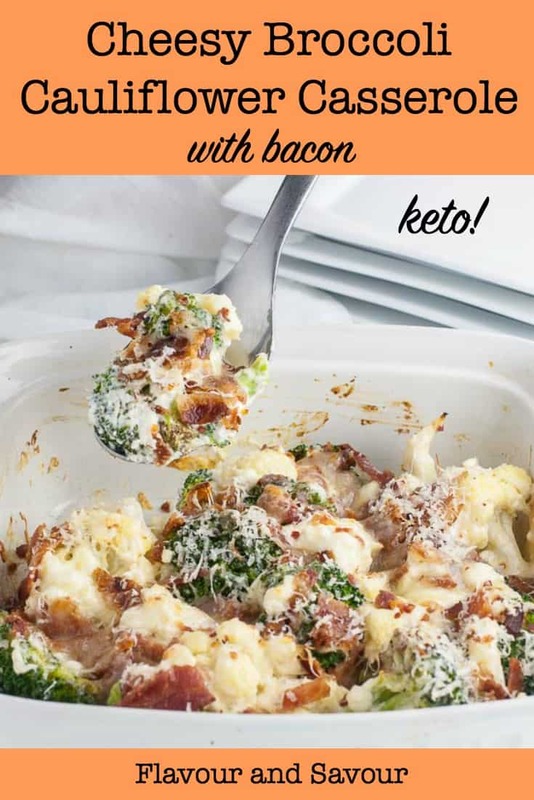 With only 2 carbs per serving, this dish is keto-friendly. Preheat oven to 400°F. Lightly oil and 8 x 8 inch baking dish. Cook bacon (see instructions for cooking bacon in the oven here) until crispy. Drain on paper towel and set aside. Cut broccoli and cauliflower into small florets. Transfer to a large bowl and toss with olive oil and sea salt. Spread out on a baking sheet and roast in oven for 10 minutes or until cauliflower is almost fork tender. Remove from oven and drain on paper towel, pressing lightly with another sheet on top to remove as much excess moisture as possible. This step is important to prevent the casserole from being watery. Mix the softened cream cheese with the minced garlic and 1/2 cup Parmesan cheese. If it's not soft enough, melt it slightly in a microwave for 30 seconds. 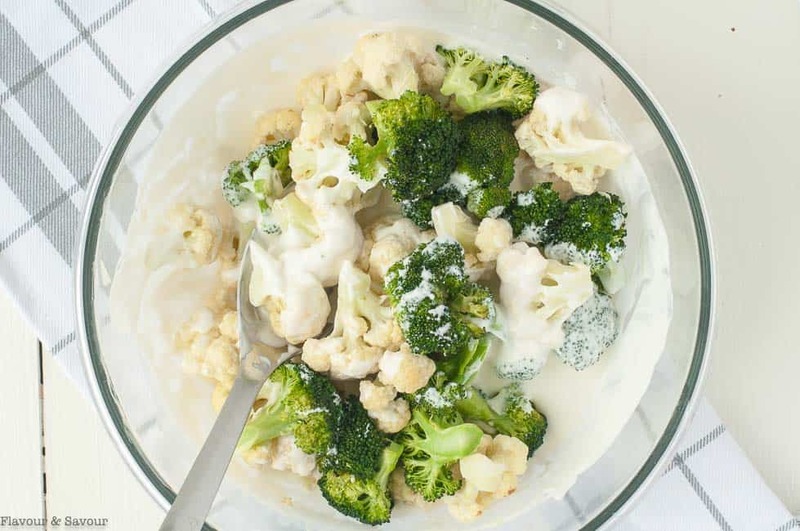 Add the roasted broccoli and cauliflower to the bowl and stir to combine. Chop the bacon slices into small pieces and add to the mixture. 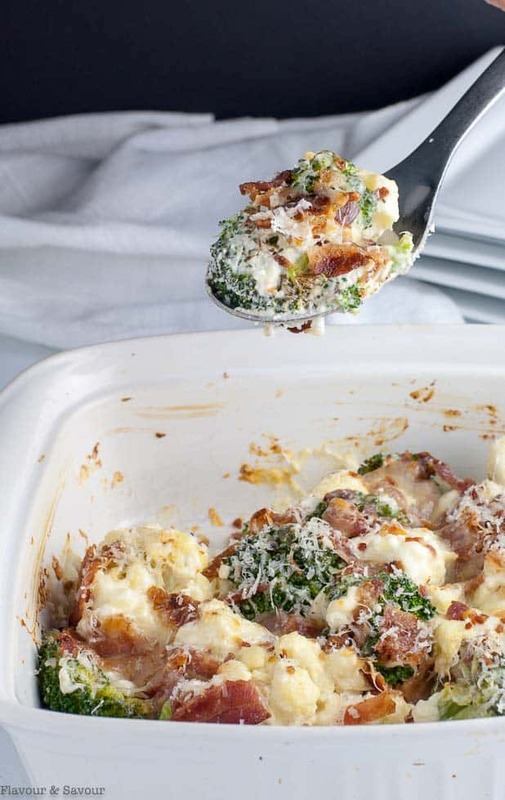 Press firmly into the prepared baking dish and sprinkle with the remaining 1/2 cup of Parmesan cheese. At this point you can cover and refrigerate until you're ready to bake, or bake right away at 400°F. for 18 - 20 minutes or until cheese has melted and casserole is beginning to brown.